Valve guitar amplifier repairs (I specialise in these). All faults and also servicing. 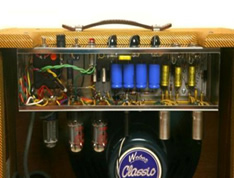 Click here to find out why your valve amp might need servicing. Anything vintage - the older the better! Solid State (transistor) guitar amplifier repairs. All faults. PA amplifier repairs and keyboard amplifier repairs. Guitars - electronic faults only. I cannot set up bridge heights and so on. Other non-audio equipment - always happy to give you a quote. If it's not on the list above, do drop me an email for an opinion on repairability. Click here to see a list of equipment I cannot repair.